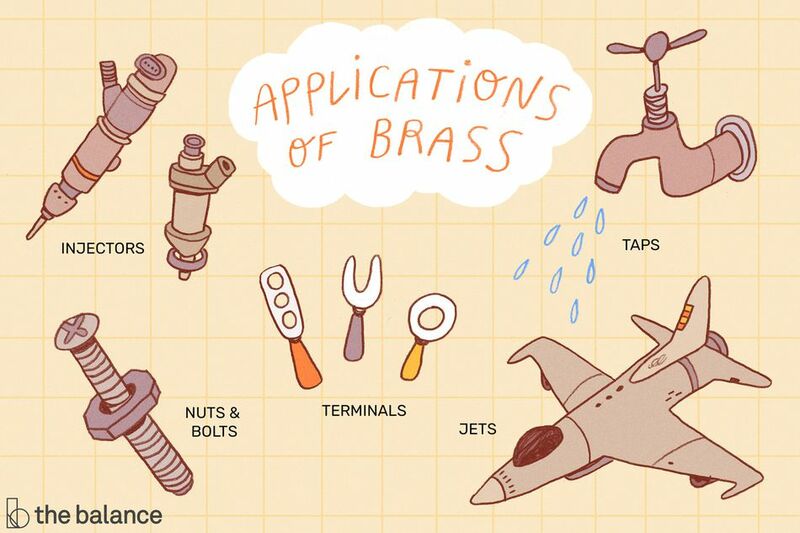 Brass is a binary alloy composed of copper and zinc that has been produced for millennia and is valued for its workability, hardness, corrosion resistance, and attractive appearance. The exact properties of different brasses depend on the composition of the brass alloy, particularly the copper-zinc ratio. In general, however, all brasses are valued for their machinability or the ease with which the metal can be formed into desired shapes and forms while retaining high strength. While there are differences between brasses with high and low zinc contents, all brasses are considered malleable and ductile (low zinc brasses more so). Due to its low melting point, brass can also be cast relatively easily. However, for casting applications, a high zinc content is usually preferred. Brasses with a lower zinc content can be easily cold worked, welded and brazed. A high copper content also allows the metal to form a protective oxide layer (patina) on its surface that guards against further corrosion, a valuable property in applications that expose the metal to moisture and weathering. The metal has both good heat and electrical conductivity (its electrical conductivity can be from 23% to 44% that of pure copper), and it is wear and spark resistant. Like copper, its bacteriostatic properties have resulted in its use in bathroom fixtures and healthcare facilities. Brass is considered a low friction and non-magnetic alloy, while its acoustic properties have resulted in its use in many 'brass band' musical instruments. Artists and architects value the metal's aesthetic properties, as it can be produced in a range of colors, from deep red to golden yellow. Copper-zinc alloys were produced as early as the 5th century BC in China and were widely used in central Asia by the 2nd and 3rd century BC. These decorative metal pieces, however, can be best referred to as 'natural alloys,' as there is no evidence that their producers consciously alloyed copper and zinc. Instead, it is likely that the alloys were smelted from zinc-rich copper ores, producing crude brass-like metals. Greek and Roman documents suggest that the intentional production of alloys similar to modern brass, using copper and a zinc oxide-rich ore known as calamine, occurred around the 1st century BC. Calamine brass was produced using a cementation process, whereby copper was melted in a crucible with ground smithsonite (or calamine) ore.
At high temperatures, zinc present in such ore turns to vapor and permeates the copper, thereby producing a relatively pure brass with 17-30% zinc content. This method of brass production was used for nearly 2000 years until the early 19th century. Not long after the Romans had discovered how to produce brass, the alloy was being used for coinage in areas of modern-day Turkey. This soon spread throughout the Roman Empire. 'Brass' is a generic term that refers to a wide range of copper-zinc alloys. In fact, there are over 60 different types of brass specified by EN (European Norm) Standards. These alloys can have a wide range of different compositions depending upon the properties required for a particular application. Brass is most often produced from copper scrap and zinc ingots. Scrap copper is selected based on its impurities, as certain additional elements are desired in order to produce the exact grade of brass required. Because zinc begins to boil and vaporizes at 1665°F (907°C), below copper's melting point 1981° F (1083°C), the copper must first be melted. Once melted, zinc is added at a ratio appropriate for the grade of brass being produced. While some allowance is still made for zinc loss to vaporization. At this point, any other additional metals, such as lead, aluminum, silicon or arsenic, are added to the mixture to create the desired alloy. Once the molten alloy is ready, it is poured into molds where it solidifies into large slabs or billets. Billets - most often of alpha-beta brass - can directly be processed into wires, pipes, and tubes via hot extrusion, which involves pushing the heated metal through a die, or hot forging. If not extruded or forged, the billets are then reheated and fed through steel rollers (a process known as hot rolling). The result is slabs with a thickness of less than half an inch (<13mm). After cooling, the brass is then fed through a milling machine, or scalper, that cuts a thin layer from the metal in order to remove surface casting defects and oxide. Under a gas atmosphere to prevent oxidization, the alloy is heated and rolled again, a process known as annealing, before it is rolled again at cooler temperatures (cold rolling) to sheets of about 0.1" (2.5mm) thick. The cold rolling process deforms the internal grain structure of the brass, resulting in a much stronger and harder metal. This step can be repeated until the desired thickness or hardness is achieved. Finally, the sheets are sawed and sheared to produce the width and length required. All sheets, cast, forged and extruded brass materials are given a chemical bath, usually, one made of hydrochloric and sulfuric acid, to remove black copper oxide scale and tarnish.